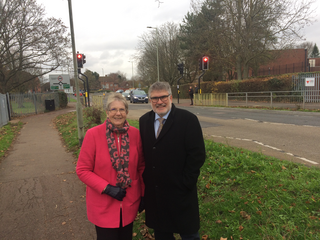 Mayor Dave Hodgson has announced that as part of comprehensive traffic decongestion plans a new footbridge will be installed over Manton Lane in Bedford. A previous footbridge was replaced over ten years ago with a pedestrian crossing in an infamous move by the former Conservative County Council, despite the fact that the location already suffered from severe traffic congestion on a daily basis. Local Councillors and local residents argued strongly at the time that the removal of the bridge would exacerbate the congestion at this notorious traffic hotspot. Sure enough, as local motorists know, the loss of the bridge did indeed prove to worsen congestion in this notorious area for peak-time traffic. Now, as part of a range of measures in the area to tackle the congestion suffered daily by motorists under the Transporting Bedford 2020 Programme, the Council will install a new footbridge, removing a contributory factor in the build-up of traffic. Other works planned across the three key junctions in this area including extra capacity, remodelling of the roundabouts and more. Construction of the footbridge is subject to planning permission and completion of an agreement with the Harpur Trust, which runs Bedford Modern School on either side of the road. The bridge is scheduled to be installed in the early part of 2020. "Residents who suffer these delays daily know that decisive action including new and improved infrastructure is required, and the footbridge is part of that."